Why is Andrew Michell a Christian? There are many reasons why I chose to be a follower of Jesus. However, rather than list all of them and explain them in detail I will aim for brevity and list only the top two reasons. 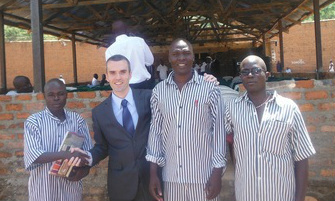 Andrew sharing hope with prisoners in Africa. Summary: There are many reasons why I am a follower of Jesus but only the top two reasons are sufficient here. First, he is alive from the dead. To believe in the resurrection is an act of intelligence to fairly evaluate the evidence of his resurrection. Second, Jesus answered my prayer and gave me a new heart, new mind, and new life. I am a follower by intellectually evaluating the evidence and I am a follower by experiencing the power of God in my life. A combination of faith and reason. Reader, What will you do with the evidence for the resurrection? What will you do with Jesus who rose from the dead? He changed my life and gave me a new heart. Jesus can do that in your life also.